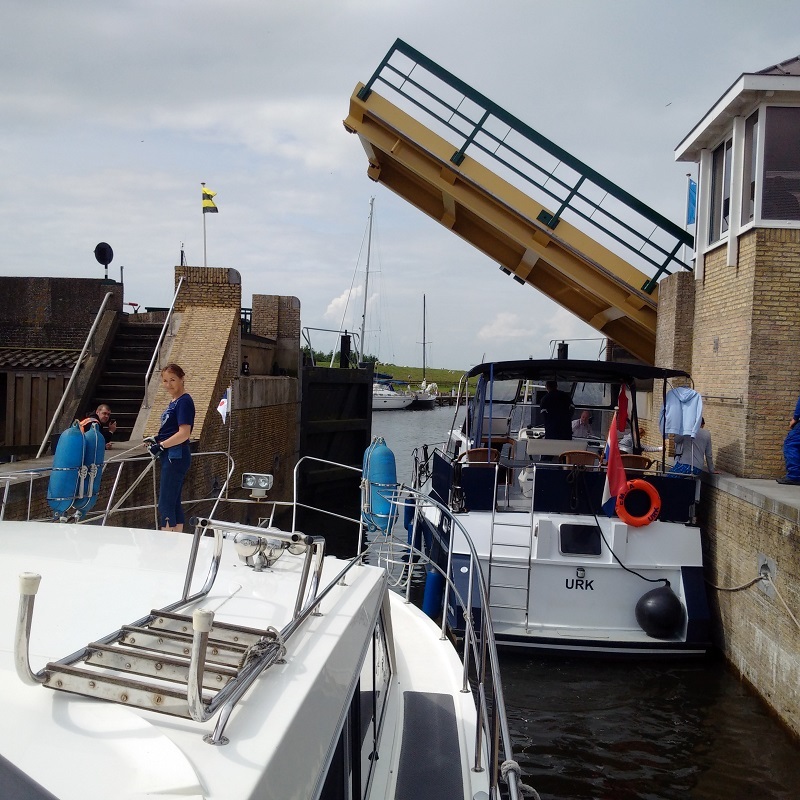 A cruise in good conditions from Workum and up the East coast of the IJsselmeer to Makkum; staying outside of the red and white buoys for deep water, negotiating sea locks and bridge lifts with the cost of €5 at both locations, until we moored up in Makkum's lovely Gem. Binnenhaven. The entrance to Makkum always has to be taken carefully in the buoyed channel from the north-east without cutting the corner due to the sand spit. The cruise was very straightforward and I made it the more so by deciding that we would ship the ropes and fenders and take the folding chairs and bicycles down below. 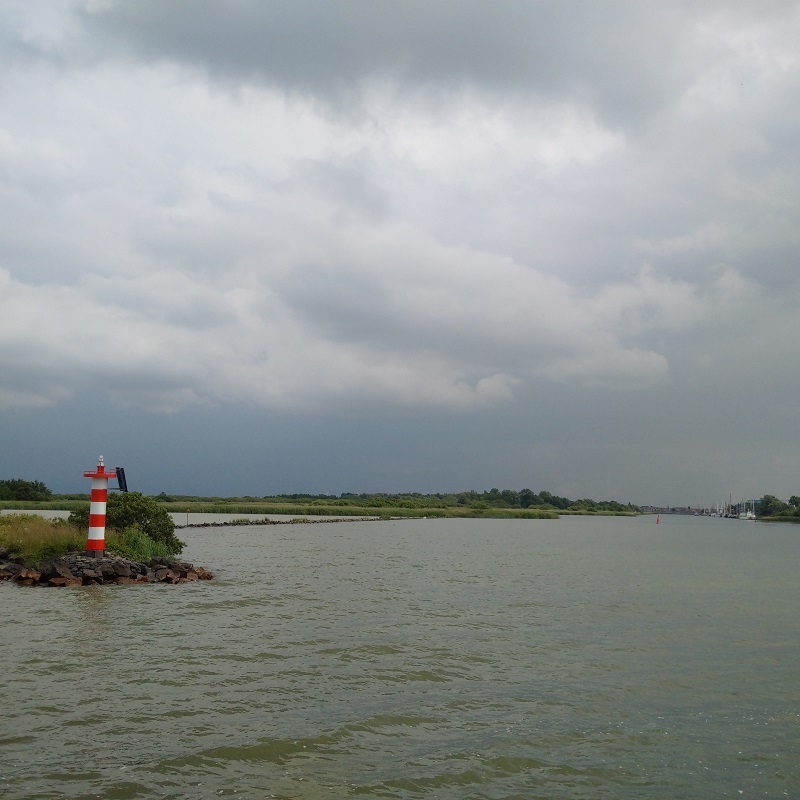 The Ijsselmeer was benign today but there was a beam sea again and it was a little choppy at times, but this meant that we did not have to worry. The bridges and sluises opened easily for us both leaving Workum and the same at the other end, as we cruised into the Binnenhaven at Makkum to find a space in the very centre of the town. 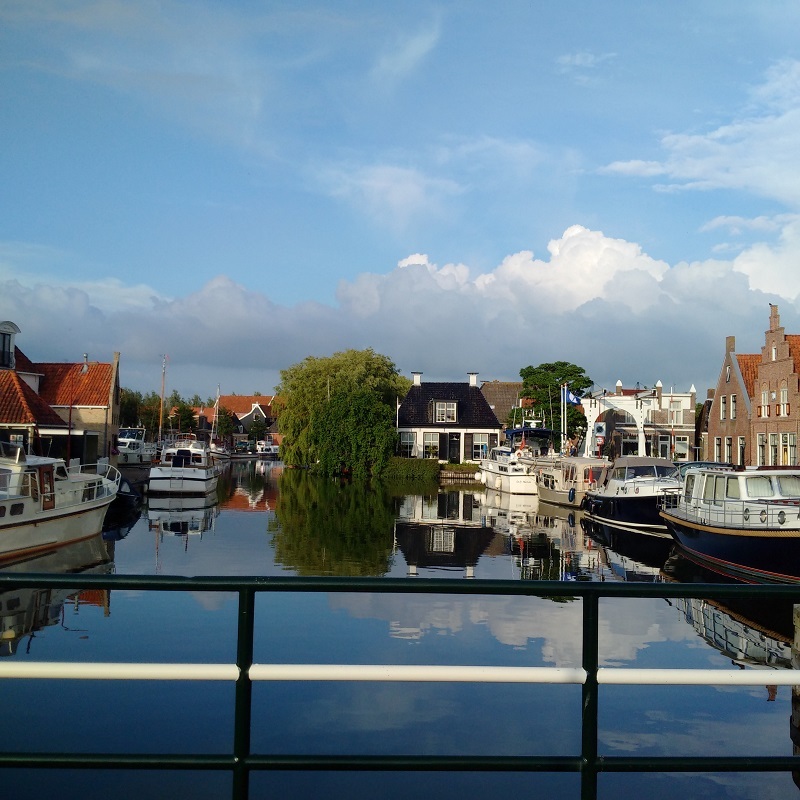 We took our dog Max and walked to the harbourmaster’ office, overlooking the Schutsluis , paid for two days and then had a beer in the town square before finding the recommended bakery for some lovely cakes. Kathleen then used the supermarket as I walked Max on a nearby green cycle track and then we relaxed on the boat for the afternoon; Kathleen catching up on some sleep whilst I worked writing. I let her sleep for quite a while and then called her with some tea rather later and she was worried that she might not be able to sleep tonight, but she need not have worried! We then took a walk together later, seeing the rest of the Binnenhaven, the town and taking pictures of things. There was a pretty house just beyond the moorings and with a fine English style garden with climbing roses and the gentleman owner was out there later dead-heading the roses and appreciated our praise. He loves his place and we could see why. After this, we came back and I sat outside in the evening sunshine and Kathleen made our ‘gala dinner’ of a prawn cocktail starter and then grilled cod and minted vegetables. We had found the excellent bakers, bakker 'Kluft', which enjoys a regional reputation and bought some cakes which we enjoyed for our desert. A nice view from our boat and we dined outside late into the evening under our porch and thundery showers completed the day before a fine sunset.